Sarcopenia, or age-related muscle loss, could have a significant impact on a person’s ability to carry out regular day-to-day activities. Understanding the cause, symptoms, as well as how nutrition and exercise factor into this condition can be helpful. What is sarcopenia? Well, a simple sarcopenia definition is loss of muscle mass due to natural aging. When a person experiences a decrease in muscle, it has an impact on their strength. This means walking, climbing stairs, and lifting objects can be a real challenge. After age 30, our muscles start to gradually deteriorate, so it shouldn’t be surprising that sarcopenia is a problem for millions of Americans. People who are inactive can lose anywhere from three to five percent of their muscle mass each decade after the age of 30. Even if you are active, you can still experience age-related muscle loss. Age-related sarcopenia happens gradually, but research shows that it occurs faster around the age of 75. Since muscle mass makes up about 60 percent of our body mass, any changes to active tissue can be life-altering. Sarcopenia is often the reason for falls and fractures in the elderly population. Sadly, age-related muscle loss has been linked to both acute and chronic ailments, such as increased insulin resistance and rheumatologic conditions. There are, in fact, different types of sarcopenia. Age-related sarcopenia is considered primary sarcopenia since millions of people experience it no matter what their lifestyle might be like. Below we outline secondary forms of sarcopenia. Activity related sarcopenia: Occurs due to bed rest, sedentary lifestyle, deconditioning, or zero gravity conditions. Disease-related sarcopenia: Linked with advanced organ failure, malignancies, inflammatory disease, or endocrine disease. As I am sure you have realized from the types above, sarcopenia causes can vary. What is consistent though is how it occurs. The loss of muscle mass is a result of a reduction in the number of muscle fibers and a decrease in their size. This mix of fewer and smaller muscle fibers leads to muscle atrophy or shrinking. Protein production: As people get older, their body’s ability to produce proteins decreases, which can cause muscle cells to shrink. Hormonal changes: Usually testosterone levels and insulin-like growth factor (IGF-1) impact both muscle growth and mass. Disease triggers: Chronic or musculoskeletal conditions have been linked to a higher rate of muscle atrophy and shrinking. Environmental triggers: A combination of a decline in activity and decline in good nutrition. In addition to the causes outlined above, recent research has helped medical scientists gain a better understanding of molecular pathways involved in skeletal muscle health and has highlighted how tissue growth factor signaling and declines in mitochondrial function might trigger sarcopenia. Mitochondria are structures within cells that convert energy from food into a form that cells can use. Even though age is the main cause of sarcopenia, it is important for us to emphasize that getting little or no exercise on a regular basis puts you at a higher risk of developing the condition. As well, older adults who eat less than they should are at an increased risk of age-related sarcopenia. Some studies suggest that up to 41 percent of women and 38 percent of men over the age of 50 eat less protein than the daily-recommended amount. Consuming acid producing foods and eating too few fruits and vegetables can also impact muscle mass. Symptoms of sarcopenia can vary depending on how much muscle mass has decreased. It is important to take note of sarcopenia symptoms because they can affect independence. There are a number of methods for sarcopenia diagnosis and treatment. Let’s look at diagnosis first, beginning with body imaging techniques. Some of the techniques may sound familiar since they are used to diagnose other common conditions. This includes computerized tomography (CT scan), magnetic resonance imaging (MRI), and duel-energy X-ray absorptiometry (DXA). Both the CT and MRI can separate fat from other soft tissues so it is a preferred method for estimating muscle mass. DXA allows for a reliable assessment of lean body mass but some doctors question it due to the fact that it has been known to have difficulty detecting the difference between water retention and fatty infiltration. BIA is really a device that estimates fat as well as lean body mass. It works well along with MRI evaluation. It is considered a good test for patients who are bedridden because it is portable. This is the measurement of human features, such as height, weight, and percentage of body fat. This method can produce errors in older people due to changes in fat deposits and loss of skin elasticity. Testing handgrip strength can be a good indicator of overall muscle strength. It has been established that handgrip strength is strongly related to lower extremity power, knee extension torque, as well as calf cross-sectional muscle area. A handgrip strength of less than 30 kg in males and less than 20 kg in females can indicate sarcopenia. Muscle strength in legs can be measured with an isometric test that looks at how much resistance can be handled when it is applied to the ankle as the person is seating with the lower leg hanging down and the knee flexed at 90 degrees. A simple test to measure the functioning of lower extremities using tasks that are similar to daily activities. SPPB can examine balance, and ability to get in and out of a chair. A test that measures the time it takes someone to rise from a chair, walk three meters, turn around, walk back to the chairm and sit down. Commonly called TUG, it is often used in geriatric assessments. A sarcopenia diagnosis technique that assesses gait speeds. While an average gait speed for an older adult is from 0.60 to 1.45 meters/second, a speed of 0.8 m/s in a four-minute walk can indicate sarcopenia. If you are diagnosed with this condition, the most common sarcopenia treatment is exercise. Resistance or strength training will likely be recommended since such activities can increase the muscle strength and endurance. While it is not the preferred approach, some people are prescribed medications for sarcopenia, including hormone stimulators and hormone replacement therapy (HRT). It is important to note that HRT does come with an increased risk of certain cancers and other health problems. There are some other potential sarcopenia treatments being considered, including different testosterone supplements, growth hormone supplements, and medications for treating insulin resistance. We have already established that nutrition is important if you want to avoid sarcopenia. Nutrition for sarcopenia must take protein and vitamin D into account. The common recommendation is dietary protein intake of 1.0-1.2 g/kg body weight/d divided over each meal daily. Vitamin D intake should be 800 IU/d along with adequate exercise. Research shows us that older adults tend to be at risk of low protein intake. One study indicated that 27 to 41 percent of adult women over the age of 50 consumed less protein than recommended, while men over 50 consumed 15 to 38 percent less. Studies show that protein deficient meals do not stimulate protein synthesis since blood amino acids don’t increase. Supplementing with whey protein can be helpful since it can deliver amino acids. When it comes to vitamin D, many people turn to supplementation. Vitamin D is something that should be measured in all individuals who are suspected of having sarcopenia since depleted vitamin D has been linked with low muscle strength. If you are vitamin D deficient, talk to your doctor about how much you need to take on a daily basis. 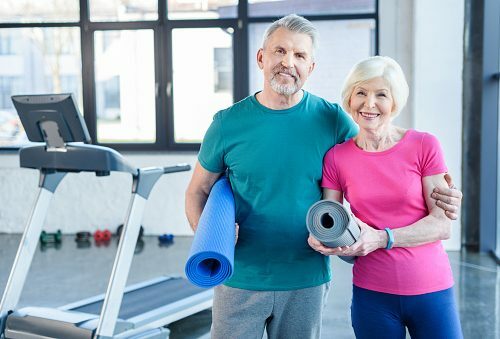 Since getting physical exercise is the primary prescription for those who are suffering from sarcopenia, it makes sense to explain the reasoning behind it. The goal of sarcopenia exercise is to gradually over-work the muscles in order to make positive change. At the same time, normal age-related physiology has to be taken into account so that injury can be prevented. What this means is that exercise programs for sarcopenia usually focus on gradual, progressive resistance training that target specific muscle groups. Movements that involve the lower extremities are normally suggested in cases where balance and mobility are an issue. Relying on the expertise of a qualified physical therapist can help people gain muscle strength faster as well as prevent further muscle damage and falls that can lead to fractures. There is no way around the aging process. From the time we are born, our muscles begin changing. As we get older, we are all prone to loss of muscle strength. However, our lifestyle—the way we treat our bodies throughout our lives—can make a big difference in the level of age-related muscle deterioration we experience.